Gastric cancer (GC) is the fourth most common cancer and second cause of cancer-related deaths worldwide. Its incidence and mortality have decreased in recent decades, mostly due to better diagnostic tools and treatment modalities. Epidemiologically, its distribution is higher in Asian countries. Its association with the presence of Helicobacter pylori was first described in 1991. Common metastatic sites are the liver and the peritoneum. Spreading to the meninges causing leptomeningeal carcinomatosis (LC) is less common but has repeatedly been reported as a secondary site of metastasis. There are few case reports of gastric LC as primary manifestation (LCp) of disease. Common neurological symptoms include headache, nausea and vomiting, seizures, as well as isolated cranial nerve palsy. The available data suggest a devastating prognosis, therefore limited evidence of appropriate treatment in this setting. Key points in choosing the appropriate treatment modality or chemotherapy regimen include the patient’s general condition and burden of symptoms, expected efficacy of systemic versus local treatment, and central nervous system penetration. In an effort to optimize prognosis beyond conventional chemotherapy, signaling pathways and targeted therapies emerge. The MYC oncogene and its role in carcinogenesis including GC are well known, although targeting its pathway remains challenging. Its correlation to the transmembranic protein mucin 1 (MUC1) and its oncogenic subunit MUC1-C, which is aberrantly overexpressed in tumors, has recently been shown in breast cancer, lung cancer, and myeloma cell lines. Consequently, blockade of this pathway has inhibited tumor growth in vitro. Similar results arise from GC cell lines, where activated MUC1-C in immunochemistry assays correlated with clinical data and linked to poor prognosis. Moreover, interesting data link inflammation to carcinogenesis through an interaction of MUC1-C with TGF-β–activated kinase 1 (TAK1), resulting in the activation of NF-κB signaling. Since MUC1 covers the entire intestinal mucosa and TAK1 is present in inflammation, both play an important role in promoting carcinogenesis in the setting of chronic inflammation and constitute promising therapeutic approaches. We report a case of a 48-year-old female patient with LCp due to GC. The patient was admitted to the neurology department after complaining of persistent headaches and nausea. In addition, stenosis of the left subclavian vein was seen, which was managed with an intraluminal stent implantation. Clinical evaluation was remarkable for supraclavicular lymphadenopathy. Computer tomography imaging showed metastatic infiltrates in the liver, spinal column, lungs and lymph nodes. Brain magnetic resonance imaging (MRI) revealed leptomeningeal enhancement as well as malignant infiltrates at the frontal lobe and cerebellum. Cerebrospinal fluid (CSF) analysis was remarkable for atypical malignant cells with signet-ring characteristics. The patient underwent upper gastrointestinal endoscopy, which showed a suspicious malignant ulcer at the small curvature, although biopsies from the site were not pathognomonic. Further endoscopic procedures, including colonoscopy and bronchoscopy failed to demonstrate a primary tumor site. Due to burden of disease symptoms and conclusive findings in CSF, an individualized plan was discussed with the patient and relatives. We applied intrathecal (IT) chemotherapy with methotrexate and systemic chemotherapy with 5-fluorouracil, folic acid, oxaliplatin and docetaxel (FLOT protocol). The patient tolerated the therapy well. IT chemotherapy was repeated once weekly, overall 4 times, to reduce malignant cell burden in CSF. Nevertheless, our patient’s course was refractory to all therapeutic measures with worsening neurological symptoms and clinical condition. MRI was repeated, showing progressive widening of the third ventricle, compatible with CSF flow obstruction and hydrocephalus. She received palliative care and died 2 months after diagnosis. Brain magnetic resonance imaging (MRI). Images on the left belong to the initial examination with a 3-T Ingenia Philips MRI. Images on the right are from the follow-up examination with a 1.5-T Achieva dStream MRI. Follow-up examination images contain artifacts because deterioration of the clinical status and poor patient compliance allowed only a shortened modified MRI protocol. 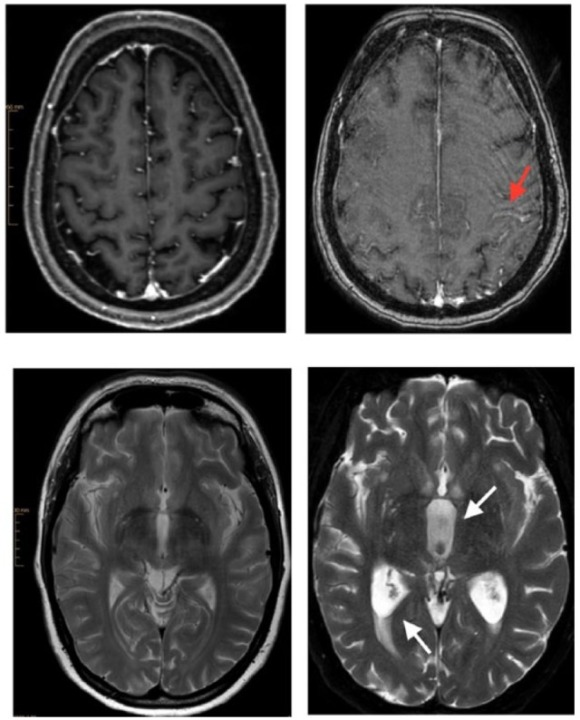 The upper images show subarachnoid leptomeningeal enhancement of contrast medium along the central sulcus (arrow) through leptomeningeal carcinomatosis. The lower right image demonstrates cerebrospinal fluid flow obstruction resulting in hydrocephalus with widening of the third ventricle (arrow), triangular widening of the lateral ventricles and transependymal diapedesis (arrow). LC presents in approximately 2% to 4% of all patients with cancer, but its incidence is much lower in GC.Undiagnosed LC in autopsy series may be present up to 20%. Most of the reported cases refer to secondary manifestation of LC with the GC diagnosis preceding in time intervals between months to years and include different treatment modalities of the preceding GC.The LCp as an initial manifestation of metastatic GC has rarely been reported. We reviewed the literature to evaluate the prognosis and treatment approaches. Overall, 4 patients are cited in the literature over the past 10 years. Guo et al also reviewed case reports and cited further cases before 2007. The first description was by Agnelli et al in 1980. Symptoms associated with LCp included not only headache, nausea and vomiting, altered mental status but also cranial nerve palsy manifested through hearing loss or facial paralysis. MRI frequently revealed hydrocephalus. Other findings included high signal intensities, either multifocal or suggestive of the involved nerve, for example vestibulocochlear. Meningeal enhancement of contrast medium is not pathognomonic and may be absent. However, MRI without radiologic abnormalities does not exclude LC. Although MRI with gadolinium enhancement remains the most sensitive imaging study, abnormalities appear only in 67% of patients with LC. CSF analysis showed mild pleocytosis, elevated opening pressure and protein, as well as reduced glucose levels, although these findings varied and are not specific of LC. The CSF pathology revealed malignant cells with adenocarcinoma or signet-cell morphology. A repetition of the CSF cytology may be necessary to warrant diagnosis. Treatment may consist of not only systemic as well as IT chemotherapy, radiotherapy but also palliative care, taking into consideration the patient’s general condition. In the literature review, systemic treatment was given in 1 case and consisted of S-1 and paclitaxel, as well as radiotherapy. The rest of the patients were not given any tumor-specific therapy due to rapid deterioration of their physical condition. Raj et al described prolonged survival up to 13 months after chemotherapy with high-dose irinotecan, a novel approach concordant with glioma chemotherapy regimens. Intrathecal treatment was not preferred in the reported cases. Radiotherapy was carried through in 1 case. Our patient received both systemic and IT chemotherapy. For the systemic treatment, FLOT protocol was preferred over docetaxel, cisplatin and 5-fluorouracil. Good tolerability and similar efficacy were shown in clinical trials. As far as IT chemotherapy is concerned, cytological negative conversion has been reported as a positive prognostic index. Unfortunately, persistent high values of malignant cells in CSF were detected in our patient despite repeated IT chemotherapy with methotrexate. Other types of IT agents include thiotepa, liposomal and conventional cytarabine. Combination IT with conventional or sustained-release cytarabine did not improve outcome in LC of GC. Considering the high incidence of reported hydrocephalus, either at the point of diagnosis or its development as disease worsens, the implantation of a ventriculoperitoneal shunt appears rational. Available data support a significant improvement of symptom burden in case of LC-induced hydrocephalus. Prognosis of LCp due to GC is extremely limited. In the reported cases, it rated from 11 to 120 days. Similar findings are also reported in all LC, leaving treatment options uncertain. Testing for HER2 overexpression and targeted treatment is appealing for GC. So far, available data for trastuzumab originate from patients with breast cancer, where safety of IT administration was shown. Moreover, in the palliative treatment of GC, vascular endothelial growth factor receptor (VEGFR) blockade, for example with ramucirumab, achieved prolonged overall survival. This may result in higher incidence of LC in the course of disease, where it will be interesting to evaluate prognosis under anti-VEGFR treatment. Overall, our case report and literature review demonstrated the devastating prognosis but failed to identify a standardized therapeutic approach to LCp in GC. Treatment should be chosen according to patient’s general condition and available options. The incidence of LC may rise as prognosis of GC improves. Symptoms such as persistent headache or cranial nerve palsy should be carefully evaluated, including imaging studies and repeated CSF analysis.